GRK Trim RT Composite screws have the smallest screw head available. Most material splitting is prevented because of the Trim head screw's exceptionally small head and the W-cut thread design. Pre-drilling is only necessary if the building materials limitations require a pilot hole to be drilled, as in hardwoods like Mahogany and Ipe'. GRK has modified its innovative FIN/Trim head screw to include reverse threading under the head to help it disappear beneath the surface of composite deck material, reducing or eliminating the dimple that sometimes appear in composite decking. 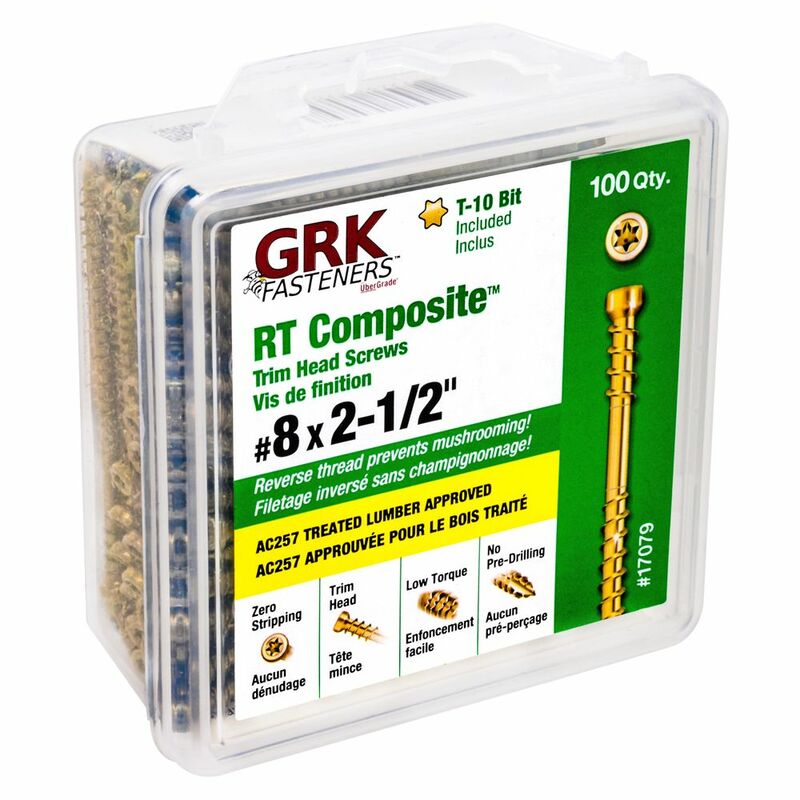 #8 x 2-1/2-inch Star Drive GRK RT Composite(TM) Trim Head Screw Climatek(TM) Coat Handy-Pak - 100pcs GRK Trim RT Composite screws have the smallest screw head available. Most material splitting is prevented because of the Trim head screw's exceptionally small head and the W-cut thread design. Pre-drilling is only necessary if the building materials limitations require a pilot hole to be drilled, as in hardwoods like Mahogany and Ipe'. GRK has modified its innovative FIN/Trim head screw to include reverse threading under the head to help it disappear beneath the surface of composite deck material, reducing or eliminating the dimple that sometimes appear in composite decking.